The Wave Structure of Matter (WSM) and Spherical Standing Wave Interactions explains Discrete Energy States of Quantum Theory / Wave Mechanics). A Simple Solution to the Particle / Wave Duality of Light and Matter, EPR, Non Locality & Quantum Entanglement. Note: This article was written several years ago. It is long (by internet standards) and basically explains the main subjects of quantum theory from a Wave Structure of Matter foundation (wave mechanics). If you prefer shorter summaries just browse the quantum physics links on the right side of this page. To begin, a few nice quotes on Quantum Physics. From 1900 to 1930 there was a revolution in the foundations of our understanding of light and matter interactions. In 1900 Planck showed that light energy must be emitted and absorbed in discrete 'quanta' to explain blackbody radiation. Then in 1905 Einstein showed that the energy of light is determined by its frequency, where E=hf. Finally, in the late 1920s, de Broglie and Schrodinger introduced the concept of Standing Waves to explain these discrete frequency and energy states of light and matter (standing waves only exist at discrete frequencies and thus energy states). So it is clear that Waves are central to Quantum Physics and our understanding of the structure and discrete energy states of Matter (which explains why Quantum Theory is also called Quantum Wave Mechanics). As we shall explain, the problems and absurdities of quantum theory have been caused by the continuing assumption of the discrete 'particle' concept for both light and matter, and thus the resulting paradox of the 'Particle / Wave' duality. As we are dealing with a scientific theory, it is necessary to begin by stating the central Principles of the 'Metaphysics of Space and Motion and the Wave Structure of Matter', which describe how Matter exists in Space as a Spherical Standing Wave and interacts with other Matter in the Space around it. From this foundation we can then deduce the solutions to many problems currently found in Quantum Theory caused by this ancient concept that matter exists as 'particles'. For example, the obvious solution to the paradox of the particle / wave duality of matter is to realise that the Wave-Center of the Spherical Standing Wave causes the observed 'particle' effects of Matter (see wave diagram below). Likewise, the discrete 'particle' properties of Light (quanta / photons) are caused by Standing Wave interactions which only occur at discrete frequencies and thus energy states. Because Schrodinger believed in real waves, he was never happy with Max Born's statistical / probability interpretation of the waves that became commonly accepted (and was actively promoted by Heisenberg and Bohr) in Quantum Theory / Mechanics. Secondly, David Bohm provides a clear account of how this incorrect 'particle' conception of matter not only causes harm to the Sciences, but also to the way we think and live, and thus to our very society and its future evolution. + = This (very rough!) diagram shows how the Spherical In and Out Waves form a Standing Wave around the Wave-Center 'particle'. So let us now explain and solve the many problems and paradoxes of Quantum Theory using the Two Principles of the Metaphysics of Space and Motion and the Spherical Wave Structure of Matter. During the years 1900-1930, many experiments were done on the interactions of light beams, particle beams, and metal targets. Analysis of these experiments showed that Light and Matter had both Particle and Wave properties. As we have said, the solution to this apparent paradox of the Particle/Wave duality is to simply explain how the discrete 'particle' properties (quanta) are in fact caused by standing Wave interactions. 3. The Equivalence of Energy, Mass and Frequency and the Compton Wavelength Y of the Electron Y=h/mc = 2.43*10-12m. In 1900 Max Planck made a profound discovery. He showed (from purely formal / mathematical foundations) that light must be emitted and absorbed in discrete amounts if it was to correctly describe observed phenomena (i.e. Blackbody radiation). Albert Einstein (1905) used Planck's relationship to explain the results of the photoelectric effect which showed that the energy E of ejected electrons was dependent upon the frequency f of incident light as described in the equation E=hf. It is ironic that in 1921 Albert Einstein was awarded the Nobel Prize for this discovery, though he never believed in particles and acknowledged that he did not know the cause of the discrete energy transfers (photons) which were contradictory to his continuous field theory of matter! Albert Einstein's suspicions were well justified, for he had spent a lifetime trying (and failing) to create a unified field theory of matter that explained both Quantum Theory / Light and Relativity / Gravity. In fact Matter, as a Spherical Standing Wave which causes the 'Field' effect, interacts with other matter in discrete standing wave patterns, not with continuous force fields as he had imagined, thus his task was ultimately impossible, as he sadly came to realise towards the end of his life. It is certainly true that the particle and its forces / fields are very useful mathematical concepts, unfortunately, they also cause many problems and paradoxes because they are approximations to reality and do not physically exist. We can now finally solve these problems by understanding the reason for these discrete energy states, which are due to the fact that standing waves only exist at discrete frequencies, like notes on the string of a guitar, thus while the Spherical Standing Wave Structure of Matter predicts that energy exchanges will be discrete, as observed, the continuous e-m wave does not anticipate this. So by 1927 the wave properties of matter had been predicted theoretically by de Broglie, and then confirmed by experiment. But unfortunately these scientists continued to believe in the existence of discrete particles, and thus they misinterpreted this most important discovery of the standing wave properties of matter. This early atomic model had some limited success because it was obviously created to explain the discrete energy states of light emitted and absorbed by bound electrons in atoms or molecules, as discovered by Planck in 1900. Fig: 1.2.1 The allowed discrete orbits of the electron as imagined by de Broglie. On the one hand the quantum theory of light cannot be considered satisfactory since it defines the energy of a light particle (photon) by the equation E=hf containing the frequency f. Now a purely particle theory contains nothing that enables us to define a frequency; for this reason alone, therefore, we are compelled, in the case of light, to introduce the idea of a particle and that of frequency simultaneously. Firstly, from reading Feynman's PhD thesis (see reference, Feynman and Wheeler, 1945) he was aware of Feynman's conception of charged particles which 'somehow' generated Spherical Electromagnetic In and Out Waves (Feynman called them advanced and retarded waves), but Wolff realised that there are no solutions for spherical vector electromagnetic waves (which are mathematical waves which require both a quantity of force and a direction of force, i.e. vector). Wolff had the foresight to try using real waves, which are Scalar (defined by their Wave-Amplitude only). And this then led to a series of remarkable discoveries. He realised that spherical In and Out-Waves removed the need for a separate particle, as the Wave-Center of the Spherical Waves created the particle effect. He then discovered that when one spherical standing wave was moving relative to another the Doppler shifts gave rise to BOTH the de Broglie Wavelength AND the Mass increase of Albert Einstein's Relativity. (i.e. Wolff demonstrated that when two charged particles (Wave-Centers of two SSWs) are moving relative to one another they gives rise to beats of interference (caused by the Doppler shifting of the In and Out Waves due to relative Motion) which were identified in experiments as the de Broglie wavelength y=h/mv, and also gave rise to the frequency increases and thus energy/mass increases (as E=hf =mc2) of Special Relativity. Unfortunately for modern physics, and ultimately for human knowledge, this obvious solution was never considered by de Broglie, Albert Einstein, Bohr, Schrodinger, Heisenberg, Dirac, Born, Feynman, etc. etc. Thus the now obvious solution of realising that matter was a Spherical Standing Wave that causes the point particle effect at the Wave-Center remained unknown and ignored, and instead, the confusing and paradoxical concept of the particle / wave duality was retained. So let us briefly explain the Compton Wavelength. Experiments show that Energy is directly related to both Frequency and Mass (this is true since we now realise that they are ALL caused by Wave-Motion). As we know from experiment the energy E and mass m of the electron, and the velocity of light c, we can calculate the Compton Wavelength Y of the Electron as follows; E=hf=mc2 and f=c/Y, thus hc/Y= mc2 resulting in Y=h/mc which for the Electron = 2.43*10-12m. Quantum theory was thus essentially founded on the experimental observations of frequency and wavelength for both light and matter. These empirical facts are obviously consistent with the Spherical Standing Wave structure of matter. It was Erwin Schrodinger who discovered that when frequency f and de Broglie wavelength y were substituted into general wave equations it becomes possible to express energy E and momentum mv (from the above equations) as wave functions - thus a confined particle (e.g. an electron in an atom/molecule) with known energy and momentum functions could be described with a certain wave function. From this it was further found that only certain frequency wave functions, like frequencies on musical strings, were allowed to exist. These allowed functions and their frequencies depended on the confining structure (atom or molecule) that the electron was bound to (analogous to how strings are bound to a violin, and only then can they resonate at certain frequencies). And here we have a final piece of the puzzle in a sense, for it was Schrodinger who discovered that the standing waves are scalar waves rather than vector electromagnetic waves. This is a most important difference. Electromagnetic waves are vector waves - at each point in Space the wave equations yield a vector quantity which describes both a direction and an amplitude (size of force) of the wave, and this relates to the original construction of the e-m field by Faraday which described both a force and a direction of how this force acted on other matter. Spherical Wave Motions of Space are Scalar waves - at each point in Space the wave equations yield a single quantity which simply describes the wave amplitude (there is no directional component). For example, sound waves are scalar waves where the wave amplitude describes the Motion (or compression) of the wave medium (air). Likewise Space is a nearly rigid Wave-Medium which propagates Wave-Motions. So let us now explain in more detail this phenomena of Light energy being emitted and absorbed in discrete amounts (photons) due to Resonant Standing Wave interactions. Firstly, we must understand Principle Two and realise that the velocity of wave Motions in Space is not constant, and in fact depends upon both the Wave-Amplitude and the mass-energy density of space (square of Wave-Amplitude). These are simply the properties of Space as a Wave-medium. It is the nature of Principles that they are stated rather than deduced. Thus we must state the Properties of Space, as Principles, and then demonstrate that logical deductions from these Principles do in fact correspond to observation. What we have found is that if Space behaves in the following way, then it gives rise to deductions which correspond to observation and experiment. The Wave Velocity (velocity of light c) varies with both the Wave-Amplitude and the mass-energy density of space (the square of the Wave-Amplitude). i) The greater the Wave-Amplitude the greater the Wave-Velocity. ii) The greater the mass-energy density of space the slower the Wave-Velocity. We do not know why Space, as a Wave-Medium, behaves this way, other than to say that these are simply the properties of Space. What we do discover though, is that from these foundations we get a simple explanation of both Charge/Light and Mass/Gravity. As gravity is explained in the article on Relativity, the general idea is only briefly summarised here. When In-Waves travel in through other Matter / Wave-Motions of Space, they slightly slow down due to the increased mass-energy density of space, and this causes the Wave-Centers to naturally move together, which we observe as Gravitational attraction. As mass-energy density of space is always positive (squares are always positive), this always causes a slowing of the In-Waves, thus explaining why gravity is always attractive. On the other hand, Wave-Amplitude is both positive and negative, thus interacting Wave-Amplitudes can either increase or decrease (i.e. combine or cancel out), causing either an increase or decrease in the velocity of the In-Waves, and a consequent moving together, or moving apart of the Wave-Centers. It is this property of Space that causes Charge / Electromagnetic Fields and in a slightly more complex manner, Light. Thus when we place two electrons near one another in Space, then the Wave-Amplitude of Space between them increases because the Waves are in phase and the Wave-Amplitudes combine and increase, thus the Wave-Velocity increases (opposite to gravity's slowing of In-Waves) and this causes the Wave-Centers to move apart. This explains the electrical repulsion of like charges. Conversely, if we place an electron and a positron (anti-matter being the opposite phase Wave-Motion to Matter, thus a positron is the opposite phase to an electron) then the Wave-Amplitude between the two Wave-Centers tends to cancel out and become smaller, thus the Wave-Velocity between the two Wave-Centers decreases (like gravity) and thus causes the Wave-Centers to move together. In fact this also explains the electron / positron (matter / antimatter) annihilation, as the Wave-Centers will eventually overlap one-another and the Wave-Amplitudes will completely cancel out (due to their equal and opposite phase) and thus disappear. This explains Charge, but does not explain Light, which is slightly more complex, though it is still caused by the same fundamental properties of Space. What we must further realise is that Light is only emitted and absorbed by electrons bound in atoms or molecules, and these electrons have some complex repeating Standing Wave-Motion about the nucleus. Thus the electrons behave as 'oscillating resonators' and it is common knowledge to electrical engineers and physicists that two interconnected resonators can undergo resonant coupling, where one resonator decreases in frequency and the other one increases a corresponding amount. Thus two bound resonating electrons (oscillators) exchange energy much like classical coupled oscillators, such as electric circuits or joined pendulums. The coupling provided by the non-linear centers of the resonances (high Wave-Amplitude Wave-Centers where the Wave-Velocities change ) causes them to change velocity, frequency, and wavelength, due to the interaction (modulation) of each other's waves. Since significant coupling can only occur between two oscillators which possess the same resonant elements, the frequency (energy) changes are equal and opposite. This we observe as the law of conservation of energy. When opposite changes of frequency (energy ) takes place between two resonances, energy seems to be transported from the center of one resonance to another. We observe a loss of energy where frequency decreases and added energy where it increases. The exchange appears to travel with the speed of the IN waves of the receiving resonance which is c, the velocity of light. When large numbers of changes occur together, so we can sample part of it, we see a beam of light. When single exchanges occur we see photons as discrete energy exchanges. The transitory modulated waves traveling between two resonances (as the Electrons/Wave-Centers move from one standing wave pattern to another) create the illusion of the photon. An exchange may require 108 to 1015 cycles to complete, depending on the degree of coupling and species of resonance. Fig: 1.4.2 Light is Caused by the Resonant Coupling of two bound Wave-Centers of Spherical Standing Waves (Electrons) with oscillating wave functions. This diagram is only an approximation, but it gives you some idea of the 'secondary' wavelength (the 'electromagnetic' wavelength of light) caused by the interactions of the In and Out-Waves of the two Electrons/Wave-Centers. Most importantly, these standing wave interactions and resonant coupling are the reason for Schrodinger's Standing Wave Equations and their obvious success at explaining the allowed energy states for electrons in atoms, and thus the discrete photon effect of light as these electrons move from one resonant standing wave pattern (quantum state) to another. This has become known as quantum entanglement and relates to the famous experiment posed by Albert Einstein, Podolsky, and Rosen (EPR) (see Section 1.7 for an explanation of this experiment) and when later technology allowed its experimental testing, it confirmed quantum theory's entanglement. Albert Einstein assumed this interconnectedness was due to the spherical spatially extended field structure of matter, instead, it is due to the interaction of the spherical spatially extended Standing Waves of matter with other matter's Wave-Centers distant in Space. Explaining this Standing Wave interaction of matter with other matter in the Space around it (action-at-a-distance) is largely the purpose of this Article and is one of the great powers of the Metaphysics of Space and Motion and the Spherical Wave Structure of Matter. This explains why he had such success and such failure at the same time, as he had the correct spherical wave structure of Matter, but he continued with two further errors, the existence of the particle, and the use of vector 'electromagnetic' waves (mathematical waves of force), rather than using the correct scalar 'quantum' waves. It is this error of Feynman's that ultimately led Wolff to make his remarkable discoveries of the WSM. Secondly, it is a mathematical fact that there are no vector wave solutions of the Maxwell Equations (which found electromagnetic fields) in spherical co-ordinates! These are profound problems that have caused contradiction and paradox within Quantum Theory to the present day, and have led to the self fulfilling belief that we can never correctly describe and understand Reality. In fact Nature behaves in a very sensible and logical way (which explains why mathematical physics exists as a subject and can describe so many phenomena, and also explains how we 'humans' have been able to evolve a logical aspect to our minds!). That it is not Nature which is strange, but our incorrect conceptions of Nature! Most importantly, the simple sensible solutions to these problems can be easily understood once we know the correct Wave Structure of Matter. 1.6.1 The Solution to the Problem of 'Renormalisation'. Richard Feynman's PhD thesis (with J. A. Wheeler, 1945) used Spherical IN (Advanced) and OUT (Retarded) e-m waves to investigate this spherical e-m field effect around the electron and how accelerated electrons could emit light (e-m radiation) to be absorbed by other electrons at-a-distant in space. One vexing problem of this e-m field theory was that it led to infinitely high fields (singularities) at the center of the point particle electron. This was avoided with a mathematical process called renormalisation whereby infinity was subtracted from infinity and the correct experimental result was substituted into the equation. It was Dirac who pointed out that this is not good mathematics - and Feynman was well aware of this! Richard Feynman was obviously also aware of this problem, and had this to say about renormalisation. Feynman's Spherical IN OUT wave theory is largely correct (and of course explains his success) but his error of using vector e-m waves resulted in infinities at the point particle as the radius tended to zero, and this led to the errors of renormalisation. In reality, Matter, as a structure of scalar spherical quantum waves, has a finite wave amplitude at the Wave-Center (as observed) and thus eliminates the infinities and the problems of renormalisation found in Feynman's Quantum Electrodynamics (QED). The Maxwell's Equations (M.E. ), which describe the formation of electric fields E by a charge distribution q and changing magnetic fields H, as well as the formation of the H field by a changing E and electric currents i, cannot describe a spherical electromagnetic wave! It is a mathematical fact that there are no wave solutions of the M.E.s in spherical co-ordinates! Only the scalar 'quantum' wave equation has spherical wave solutions. Similarly, there are no imaginable M.E. solutions for a 'photon particle'. It is clear that the M.E.s are not fundamental and the photon is only a mathematical construction. The failure of the M.E. in spherical co-ordinates can be imagined by saying, You cannot comb the hair on a tennis ball. This means that if you attempt to comb down an E field (the hair representing the electric vector) everywhere flat onto a tennis ball (a spherical surface), you must create a 'cowlick' somewhere on the ball which frustrates your attempt to comb it. The questions arise, Why did theorists continue to favour the e-m field, the photon, and M.E. for 70 years in spite of the well-known flagrant failure of the mathematical description to agree with observation? Why were alternative descriptions of nature not sought? We suspect the answer is because it worked once the errors were removed with a bit of 'hocus pocus' mathematics and the aid of empirical data. Unfortunately, this logical positivist view to retain the point particle and vector force fields has been the root cause of the many paradoxes and mysteries surrounding quantum theory. The resulting confusion has been increasingly exploited in the popular press. Instead of searching for the simple behaviour of nature, the physics community found that 'wave-particle duality' was an exciting launching pad for more complex proposals that found support from government funding agencies. The search for truth was put into limbo and wave-particle duality reigned. Once we understand though, that the particle theory of matter is a mathematical (logical positivist) description of nature, then it becomes less confusing. Essentially the particle is a mathematical construction to describe energy exchange. It says nothing about the energy exchange mechanism and thus makes no comment about how the particle exists, how it moves through Space, what the Space around the particle is made of, and how matter particles 'emit' and 'absorb' photon particles with other matter particles distant in Space. Let us then consider one fundamentally important argument of Feynman's that light must be a particle. For many years after Newton, partial reflection by two surfaces was happily explained by a theory of waves,* but when experiments were made with very weak light hitting photomultipliers, the wave theory collapsed: as the light got dimmer and dimmer, the photomultipliers kept making full sized clicks - there were just fewer of them. Light behaves as particles. * This idea made use of the fact that waves can combine or cancel out, and the calculations based on this model matched the results of Newton's experiments, as well as those done for hundreds of years afterwards. But when experiments were developed that were sensitive enough to detect a single photon, the wave theory predicted that the clicks of a photomultiplier would get softer and softer, whereas they stayed at full strength - they just occurred less and less often. No reasonable model could explain this fact. Firstly, he is making unjustified assumptions beyond what is observed. It is true that light energy is emitted and absorbed in discrete amounts between two electrons. But we DO NOT OBSERVE any 'Particles' - we only observe discrete energy exchanges! Secondly, the solution is to realize that the Spherical Standing Wave Structure of Matter actually demands that all energy exchanges for light be of discrete amounts because this is what occurs for 'Resonant Coupling', and for standing Wave interactions in general. So now, I present to you the three basic actions, from which all the phenomena of light and electrons arise. -Action #1: A photon goes from place to place. -Action #2: An electron goes from place to place. -Action #3: An electron emits or absorbs a photon. Once we realise that there are no separate electron or photon particles, thus we remove the problem as to how an electron particle can interact with a separate photon particle! Thus this solution is actually more consistent (and simpler) than Feynman's QED, particularly when we consider Feynman's further explanation of a positron being an electron which goes backwards in Time. Further, notice what Feynman says about photons, which are treated as particles in QED, and thus by Feynman's logic there should also be anti-photons, whereas the WSM is clear on this point - there are anti-electrons (positrons) which are opposite phase Spherical Standing Waves, but there are no separate photon particles, thus no anti-photons! While it may be clever, it is not good philosophy, and it has led to a very confused and absurd modern physics. Surely it is time for physicists to start considering the fundamental theoretical problems of the existing theories and to appreciate that the Metaphysics of Space and Motion and the Spherical Wave Structure of Matter is a simple, sensible, and obvious way to solve these problems! In l935, Albert Einstein, Podolsky, and Rosen (EPR) put forward a gedanken (thought) experiment whose outcome they thought was certain to show that there existed natural phenomena that quantum theory could not account for. The experiment was based on the concept that two events cannot influence each other if the distance between them is greater than the distance light could travel in the time available. In other words, only local events inside the light sphere can influence one another. Their experimental concept was later used by John Bell (1964) to frame a theorem which showed that either the statistical predictions of quantum theory or the Principle of Local Events is incorrect. It did not say which one was false but only that both cannot be true, although it was clear that Albert Einstein expected The Principle to be affirmed. When later experiments (Clauser & Freedman 1972; Aspect, Dalibard, and Roger, 1982; and others) confirmed that quantum theory was correct, the conclusion was startling. The Principle of Local Events failed, forcing us to recognize that the world is not the way it appears. What then is the real nature of our world? The important impact of Bell's Theorem and the experiments is that they clearly thrust, a formerly only philosophical dilemma of quantum theory, into the real world. They show that post-modern physics' ideas about the world are somehow profoundly deficient. No one understood these results and only scant scientific attention has been paid to them. Figure 1.7.1 Experiment to test Bell's theorem Polarized photons are emitted at the center, pass through the adjustable polarization filters on the left and right, and enter detectors on each side. Coincidences (simultaneous detection) are recorded and plotted as a function of the angular difference between the two settings of the polarization filters. His theorem relates to the results of an experiment like the one shown in Figure 1.7.1 (see above): A source of two paired photons, obtained from the simultaneous decay of two excited atomic states, is at the center. At opposite sides, are located two detectors of polarized photons. The polarization filters of each detector can be set parallel to each other, or at some other angle, freely chosen. It is known that polarizations of paired photons are always parallel to each other, but random with respect to their surroundings. So, if the detector filters are set parallel, both photons will be detected simultaneously. If the filters are at right angles, the two photons will never be detected together. The detection pattern for settings at intermediate angles is the subject of the theorem. Bell (and Albert Einstein, Podolsky, and Rosen) assumed that the photons arriving at each detector could have no knowledge of the setting of the other detector. This is because they assumed that such information would have to travel faster than the speed of light - prohibited by Albert Einstein's Special Relativity. Their assumption reflects the Principle of Local Causes, that is, only events local to each detector can affect its behaviour. Based on this assumption, Bell deduced that the relationship between the angular difference between detector settings and the detected coincidences of photon pairs was linear, like line L in Figure 1.7.2. His deduction comes from the symmetry and independence of the two detectors, as follows: A setting difference of X, at one detector has the same effect as a difference X, at the other detector. Hence if both are moved X, the total angular difference is 2X and the total effect is twice as much, which is a linear relationship. Figure 1.7.2 The result of an experiment to test Bell's theorem Data points R of the experiments are shown with black dots. They agree with the line QM, predicted by the quantum mechanics, and do not agree with the line L, predicted by Albert Einstein's concept of causality. This was a big surprise, because the failure of causality suggests that the communication is taking place at speeds greater than the velocity of light. The curved line is the calculation obtained from standard quantum theory. 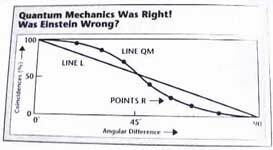 Bell, Albert Einstein, Podolsky, and Rosen, or anyone who does not believe in superluminal speeds, would expect to find line L.
In fact, the experiments yielded points R, which agreed with line QM. The predictions of quantum theory had destroyed the assumptions of Albert Einstein, Podolsky and Rosen! The results of these experiments were so disbelieved that they were repeated by other persons, using different photon sources, as well as particles with paired spins. The most recent experiment by Aspect, Dalibard, and Roger, used acousto-optical switches at a frequency of 50MHz which shifted the settings of the polarizers during the flight of the photons, to completely eliminate any possibility of local effects of one detector on the other. Nevertheless, they reported that the EPR assumption was violated by five standard deviations, whereas quantum theory was verified within experimental error (about 2%). 1. They link events at separate locations without known fields or matter. 2. They do not diminish with distance; a million miles is the same as an inch. 3. They appear to act with speed greater than light. Clearly, within the framework of science, this is a perplexing phenomenon. In some mysterious quantum way, communication does appear to take place faster than light between the two detectors of the apparatus. These results showed that our understanding of the physical world is profoundly deficient. The Spherical Wave Structure of Matter, particularly the behaviour of the In and Out Waves, is able to resolve this puzzle so that the appearance of instant communication is understood and yet neither Albert Einstein nor QM need be wrong. In order to show this, it is necessary to carefully look at the detailed process of exchanging energy between two atoms, by the action of the IN/OUT waves of both atoms. Remember that for resonant coupling it is necessary for the In and Out Waves of both electrons to interact with one another. The passage of both In-Waves through both Wave-Centers precedes the actual frequency shifts of the source and detector. A means to detect this first passage event is not a capability of the usual photo-detector apparatus and remains totally unnoticed. But the In-Waves are symmetrical counterparts of the Out-Waves and carry the information of their polarization state between parts of the experimental apparatus before the Out-Waves cause a departing photon event. The IN-waves travel with the speed of light so there is no violation of relativity. At this point you may be inclined to disbelieve the reality of the In-Wave. But there is other evidence for it. Remember, it explains the de Broglie wavelength and thereby QM. It is necessary to explain the relativistic mass increase of a moving object or the symmetry in its direction of motion. It is responsible for the finite force of the SR electron at its center. Are all of these merely coincidence? Especially, it is the combination of In and Out Waves which explains these laws, not just the In-Waves. If you believe in one you are forced to believe in the other. Can Proof of the In-Waves be Found? For someone to really believe a new theory, an experiment to show the existence of new phenomena not previously known is most persuasive. To prove the existence of the In-Waves (and thus the pre-existing interconnection of the electrons with the rest of the apparatus) would be just such a critical experiment. This can likely be accomplished with an apparatus of the type used by Aspect, Dalibard, and Rogers (1982) except that instead of making a random filter setting during a photon's passage time, the filter setting should occur during the time period preceding photon departure. The purpose is to frustrate communication by the In-Waves. As the In-Waves are necessary to the energy exchange process, then the result of the experiment would be a linear relation between the angular difference of the two filters. This would be the result originally expected by Albert Einstein for the EPR experiment. The Wave Structure of Matter is a profound new way of looking at how Matter exists and interacts with other matter in Space. Wolff has explained a very simple change to a very famous experiment that currently causes Quantum Theory, and Human intellectual knowledge in general, profound problems and paradoxes. Thus it seems to us absolutely essential that this experiment be re-done as suggested above. We sincerely hope that this work on the Metaphysics of Space and Motion and the Spherical Wave Structure of Matter will ultimately lead to this new 'Paradigm' being taken seriously, and that this experiment will be performed sooner rather than later! b) Schrodinger's Standing Wave equations can be used to describe the allowed discrete energy states for electrons (Wave-Centers) in atoms or molecules. a) The solution of the particle/wave duality of matter is obvious - Matter is a Spherical Standing Wave which creates a 'particle effect' at the Wave-Center'. The solution to the particle/wave duality of light is more complex (though it is still obvious once known) and is a consequence of the standing wave structure of matter and that only discrete standing wave interactions can occur during 'Resonant Coupling' of two bound electrons. b) Schrodinger's Wave equations confirm this discrete standing wave interaction, that only certain discrete standing wave frequencies between matter are resonantly stable which causes frequency (and thus energy) exchanges to be in discrete 'quanta' which can be mathematically explained as 'particle/photon' interactions. c) Because Spherical Standing Waves are the size of the Universe, their In-Waves are interacting with all the other matter in the Universe. As we exist as complex arrangements of Wave-Centers here on earth, we do not have immediate knowledge of how these In-Waves are interacting with this other matter in the universe, and must simply wait until the In-Waves arrive at the Wave-Center where we observe these changes in motion and position of the Wave-Center. This lack of knowledge causes the uncertainty as to how a Wave-Center will move about over time and thus qualitatively explains why probability based upon wave equations can describe this uncertainty. d) The Albert Einstein, Podolsky, Rosen (EPR) experiment performed by Aspect in 1972 famously and controversially confirmed the apparent instant interconnection of particles and contradicted Albert Einstein's Relativity which requires that all matter to matter interactions be limited by the velocity of light. Albert Einstein is in fact correct, the error of the experiment was to assume matter was a particle rather than the Wave-Center of a Spherical Standing Wave. Once this is understood then it explains how matter is subtly interconnected with other matter in the Space around it (by the In and Out-Waves) and leads to a minor change in the experiment which will confirm the Metaphysics of Space and Motion and the Spherical Wave Structure of Matter as a sensible and obvious solution to the problems and paradoxes of not only Quantum Theory, but also of Albert Einstein's Relativity and Cosmology.